That was reported by some testers lately. We don't know the cause yet, bu we're working on it. I never sent or received MMS, ever, that's why I missed it. great i will try it out, but i want to actaully change the alarm icon on the home screen to not have a new tab. No more new tab.It just can change the alarm icon's link to any program you want.Just make a try. Thanks a lot for this ROM !!! from Argentina I give you a lot aplause !!! !.....please when you can put this EXCELENT ROM in spanish...please !!! but same is FANTASTIC !!! Do you have un UPDATE of this ROM ???? will be fantastic. Hey! i just realise that when i use the nodatagprs application.. There is orange world 3G, orange internet 3G, internet orange mms 3G... my service provider is starhub so i don't understand why it is stated as orange instead of starhub. Someone please enlighten me on this issue! Read back some posts. :D I'm testing the updated ROM now. But i don't have the spanish language files (*.mui), sorry. No problem with the languages, its all right. The Sense didn't changed, but the ROM did. PagePool size changed to 6MB, and the native kernel changed too. The available memory is 161MB, and the ROM starts with 80MB free RAM. Excelent, congratulations for you hard job !!! I hope so that in few days can enjoy of your work !!! I don't have any rapidshare account and I don't want to pay for something what I can have for free. What's your problem with 4shared? The download speed is excellent (over 700KB/s). When u have installed the previous versions of Sense 2.5, it has overwritten the original mms.dll file in the windows folder, maybe this could be the problem with receiving, because I aslo have your ROM and can't receive any MMS. No, the original mms.dll placed into the ROM. That's why we not know the cause. I changed the home wallpaper just for a try with a non animated one and now it's a rainy day but i can't see neither the rain drops nor the windscreen wiper on the home screen. Just the clouds with the rain above the flip clock! Can you please tell me how to change the screen wallpaper back to the original black one? If the weather if not rainy, then you can't see any rain drops or windscreen wiper. And the Animated Wallpapers are not animated, just simple PNGs and JPEGs. I don't know how to go back to the black one. Memory leak is the one issue, that's been bothering me in this rom. Nice to hear you're working on JD1 kernel. Keep up the good work rapid :D.
Someone was talking about the new(er) touch player which CAN play videos over 100mb in the 6.5.x roms? Would you like to port it to your rom? EDIT: Just donated 10€ for you. It isn't much but still.. Code: 6BN82593FC1772359. The 100MB issues was with the JD1's touch player. The JD6 works just fine. :P I'm working only with the kernel, not the programs. but the problem is why Photo Tab is not show photo's ( favorite_folder value is [CAMERA] and I always change via Regedit and always back to value [CAMERA] ) so I will try with install your Sense_1.3-2.5_Final_Album_Fix, everything it OK but after SR the value back to [CAMERA]. can any kind soul help me plzzzz!! why does my nodatagprs application shows orange internet 3g instead of starhub internet 3g? My service provider is starhub! After using it for a day i have a few issues, some might not have been implemented in sense build. 1.) 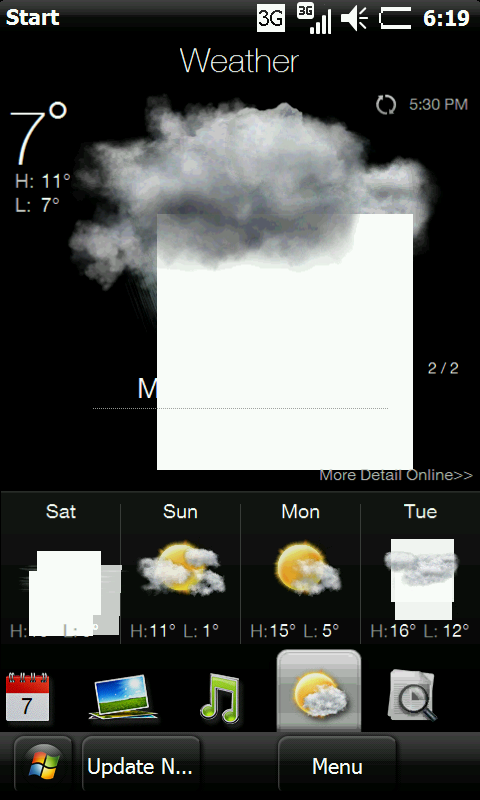 weather sometimes messes up loading the image files. See screenshot below. 3.) The music tab dose not have a alphabetical list. Allowing you to choose a letter in stead of scrolling to the letter, real pain when you have 2000+ songs and the song starts with a T or something. 4.) is there a quick way to just restart sence 2.5? right now i go into the settings and disable and enable which frees up some memory.